I first made this dish about a year ago. I know that, because it was right around the start of this blog. It was supposed to make it onto the blog, but somehow that didn’t happen. I even photographed it. It’s a shame that I deleted those pictures, because it would be fun to show you how my photography has changed over the years. Anyway, let’s talk peas. 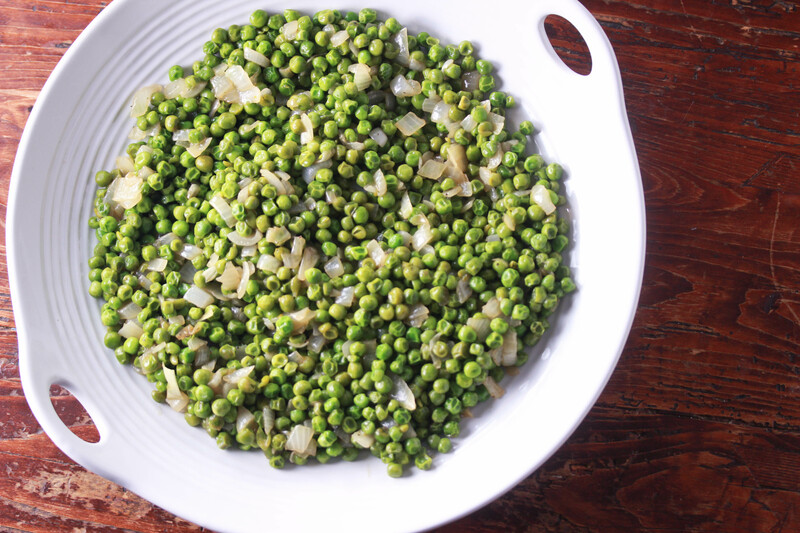 Whenever I see that cliqued up picture of a dinner plate with the heap of super boring peas on the side, I get kind of sad. Peas have such a negative, or at very least boring reputation. But they don’t have to be either of those! 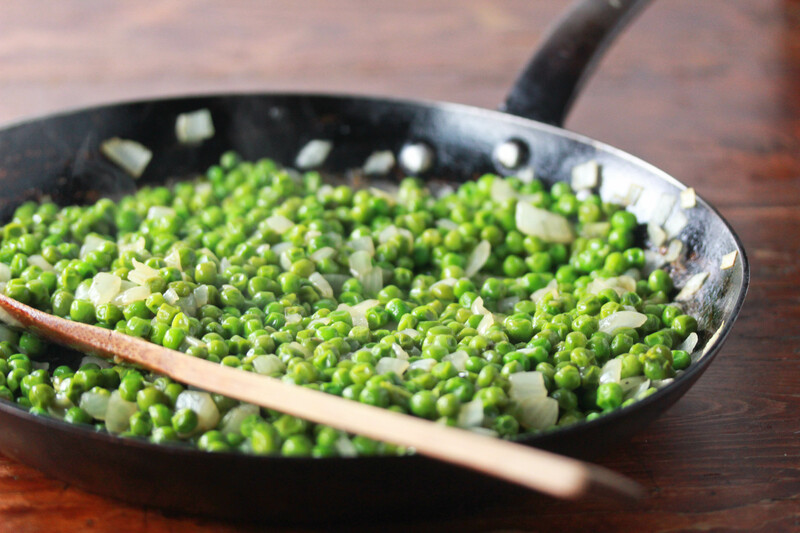 I’ve come up with a number of fun ways to cook peas, but this one is by far my favorite. 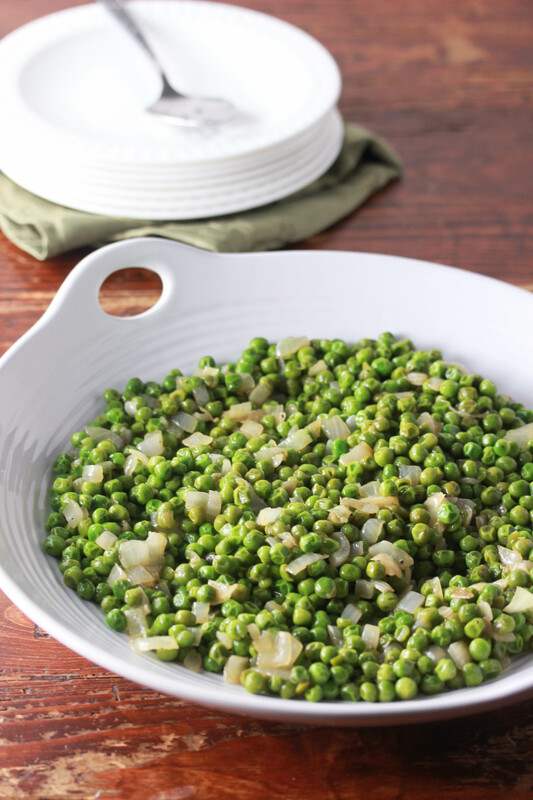 It’s super easy to whip up, and since I always have a bag of peas in my freezer, the ingredients are pretty much always on hand. So why, you might ask, has this never made it onto the blog before? Well, it’s simple, really. I can’t figure out a good name for them! I finally settled just for you, because I love these peas, and I know you will too. Heat the olive oil in a large frying pan over medium heat. Add the diced onions and saute until translucent. Add the minced garlic and peas, and continue to saute for about 2 minutes, stirring to combine the ingredients. Add the beef stock, salt and pepper to the pan, and stir to coat evenly. Turn the flame to low and leave to simmer for about 20 minutes, stirring occasionally. Perfect – I have a bag of peas in the freezer, too. 🙂 Love that serving dish! Absolutely gorgeous – aren’t peas so utterly pretty? I happen to love peas, beacuse they are very versatile. They are also one of the few veggies everyone in my house will eat. I like this recipe a lot! Thank you! Can i use canned peas instead of frozen or it won’t work? These were very nice. Only used 500g peas, otherwise didn’t change anything. Perfect! Our 11yo son is the only one who didn’t like them. Too bad for him! The rest of us gave this 9/10. Thank for a lovely recipe. I am vegetarian. will this work with veg. stock?